This adapter, modified by Reel 3-D, will slip into the hot-shoe on top of your Stereo Realist, Revere or Wollensak stereo cameras, and allow you to use a modern electronic flash unit. With the adapter, you plug in the PC (circular) plug on a cord that is a standard option with most flash units. The hot shoe on the bottom of your flash will NOT work – you must connect to the adapter with a cord and a PC plug. 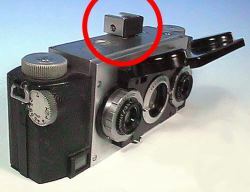 The adapter has a non-hot shoe on top to mount a flash or other accessory. For stability we suggest the use of a separate “L” bracket to hold your flash unit.